The TLB sent by the Mooi-Mpofana mayor grading the road on Peter Ward’s Harley Stone Farm on Thursday. A Mooi River farmer has opened a case of trespassing and damage to property against Mooi-Mpofana Mayor Xolani Duma. This comes after the mayor instructed municipal workers to grade a road on the farmer’s property, without the farmer’s consent, following a request by farm dwellers who will be having a funeral there this weekend. Duma told The Witness that he has, since 2016, been having problems getting through to the farmer, Peter Ward, of Harley Stone Farm in Mooi River. “He has been refusing to allow the community members residing on his farm access to water, electricity and providing an access road from the main road to their homes,” said Duma. He said Ward had refused to allow the municipality or Eskom to supply the residents with electricity and had instead said he would supply the electricity and residents would have to purchase it from him. The mayor also alleged that Ward had removed a pump that was supplying water to the residents. The residents are without electricity or running water. Duma said after much persuasion, the farmer agreed to open and grade a new road for the farm dwellers. “He only graded half the road and when I asked why, he said he did not have a budget for that, and that it was a waste of his fuel. He said if the residents wanted a road, they should grade it themselves,” the mayor said. He said he was contacted by the residents recently asking that he assist as they would have a funeral tomorrow and they were worried as the hearse would not be able to drive to their homes. The mayor then sent a TLB and municipal workers to grade the road on the farm on Thursday to ensure that the hearse is able to drive through when they bring the coffin for the funeral on Saturday. “I was contacted by the workers informing me that the farmer had chased them away. When I went to see Ward, he accused us of trespassing and even threatened to shoot me,” alleged the mayor. Speaking to The Witness on Thursday afternoon, Ward responded that Duma was “lying on every count”. 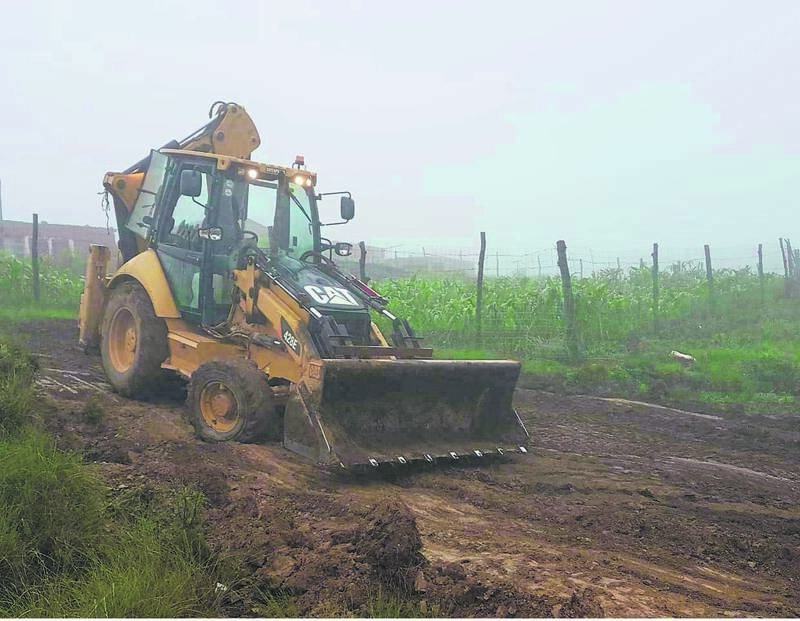 Ward said he was informed by his staff that a TLB and municipal workers were busy grading the road on his farm without his knowledge or consent. “I told them to stop because they are not entitled to come onto my private farm and start grading without my permission. They stopped but they had already damaged one of the fences. “Two hours later the mayor arrived and came to my house and started to verbally abuse me in front of his bodyguards, my wife and my staff and making false accusations such as the ones he has been telling you. “He said he had sent the TLB to prepare for a funeral happening on my farm this weekend, which is also something I have not been told about. So I asked him how he can send it without getting in touch with me and without my permission and he said he tried phoning me. I told him that’s just not good enough,” he said. Ward said he has since opened a case of trespassing against the mayor and another case of damage to property. Duma said he instructed the municipal workers to continue grading the road on Thursday.